“Build a better mousetrap” the sage of Concord said “and the world will beat a path to your door.” Build a cloudier, less sweet tea that has sediment in the bottom and, well, who knows? 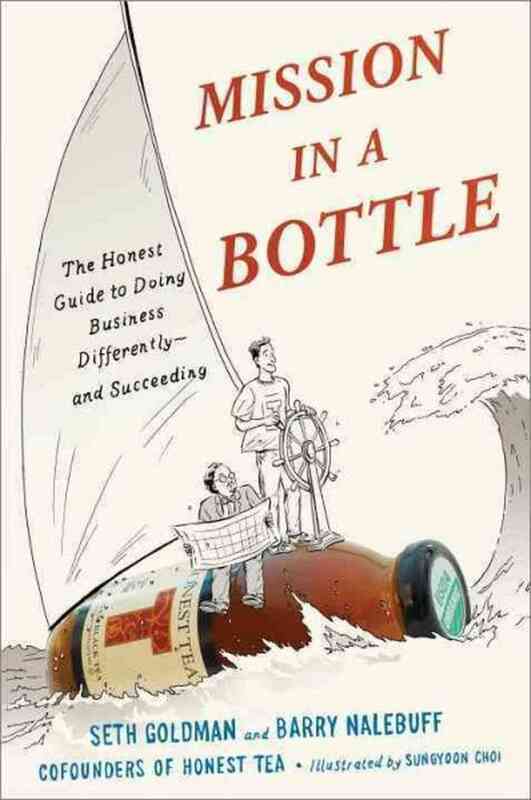 Or at least, that was the question facing Seth Goldman and Barry Nalebuff when they decided to launch Honest Tea, and is the story they tell in this admirable, quirky, and compelling book. It is, in broad strokes, the story that many entrepreneurs (before that word became the virtually exclusive domain of coders, developers and other scions of Silicon Valley) can relate to. A dissatisfied consumer builds a better or mousetrap – or more precisely, builds the kind of mousetrap that traps the kind of mice who want the same kind of refreshing beverage he wants – who then endeavors to discover if he’s an outlier or a new phenomenon, an early clue to the new direction, a signal of the coming trend. The fact that this dissatisfied consumer was a Yale MBA grad who had been a VP at The Calvert Group, makes this story not only a bit more interesting, it means that every phase of it is analyzed and considered as every good case study should be. And the fact that the co-author and co-partner in this enterprise is a former Rhodes scholar who graduated MIT with degrees in economics and mathematics and now is the Milton Steinbach Professor of Management at Yale School of Management – and was Goldman’s professor – shouts “and we mean it”. And yet, at first encounter, “Mission in a Bottle” is as odd, iconoclastic and frankly off-putting as the product itself. Why? For starters, it’s a “graphic business book”. The entire story, case studies, analyses, SWOTs and the rest are told in cartoon-like panels in which Goldman and Nalebuff are the main characters. On the one hand, that distracts from the serious business at hand. And on the other hand, it makes the story frustratingly more personal – because we see Goldman and Nalebuff not as abstract businessmen, but as actual humans with actual families and friends, trying, succeeding, stumbling, trying again, failing, and maybe failing again. But once you get past that oddness, you understand how smart it all really is. First, because you realize that it’s important to remember that these are in fact, people, who are doing this. People who have lives. Who encounter people they like, who hire people they wish they hadn’t. Who make decisions that affect lives. Who sometimes make the wrong decisions. Which is another thing about “Mission in a Bottle” that’s odd. The transparency. They make mistakes. Mistakes that they don’t just gloss over – mistakes that they obsess about. Now, you may say that if your brand promise is honesty you can’t pull back in print – but we all know that’s much easier said than done. And while someone with more familiarity with Honest Tea may point out some glaring omissions (for example, at times the last half of the book feels like it was written to justify their sale to Coca-Cola), one must still admire their spirit, their attempt to show themselves, warts and all, so that they and others may learn. The distinctive form also allows them to use some devices from the graphic novel world to exceptional advantage. For example, while the main, chronological story (finding suppliers, then investors, then distributors, then more investors, then production facilities, then still more investors) is carried generally by Seth, Barry (the Yale prof) is brought in again and again to address the theoretical aspects of the business. To step back in the way we all do in B-school and ask “Well, why did this work? Why didn’t it? And what does any of it mean?” It’s really very clever and very useful and once you get used to it. Which brings up the other reason this unusual format is smart; because it reminds you – visually, graphically, via content as well as form – that businesses must always walk that fine line between being just like other businesses, and being nothing like them at all. If you are not unique, if you are not distinctive, you fail to create a reason for selection. But at the same time, you must function within the known universe of needs and understandings. Be too far out, and no one knows what to do with you. Be not far out enough, and no one knows why they should bother. That line is one that shifts and shimmers like a mirage in the desert sun. That Goldman and Nalebuff have created a new way to illustrate it is to their credit – and invaluable to everyone else. Mission in a Bottle by Seth Goldman & Barry Nalebuff with illustrations by Sungyoon Choi was published by Crown Business on 09/03/13 – order it from Amazon here or from Barnes & Noble here – or pick it up at your local bookseller (find one here).